It’s beyond the scope of this page to do justice to all the complexities of the doshas in Ayurveda. But I’ve personally found physical internal cleansing with this triphala powder has improved not only my digestive health, but also both my mental focus and general outlook on life since I’ve been taking it. Triphala is rare in its ability to cleanse and detoxify the human body while simultaneously strengthening and nourishing it. Working as a gentle laxative, it stimulates the peristaltic actions of the intestines to improve elimination whilst removing toxins. At the same time it is said to rejuvenate the lining of the gastrointestinal tract, providing favorable conditions for the beneficial bacteria that your immune system relies on so much. With your intestinal health improved, digestion and importantly assimilation of the food and nutrients you eat is also enhanced. As we’ll see ahead, this can be especially beneficial for weight loss, as well as general tiredness and fatigue and a whole host of different illnesses. Powdered triphala is a particularly effective treatment for constipation and you can find how to use it for this purpose here. Benefits of triphala also include being a powerful liver cleanser and detoxifier, improving gallbladder function and rejuvenating and strengthening the kidneys. It is even prescribed in India as a treatment for kidney stones. Perhaps due to its beneficial effects on the liver, triphala is often recommended as an effective blood purifier. The amla fruit it contains in particular is extremely rich in antioxidants to improve circulation and promote healthy cellular regeneration. One important precaution though when taking triphala powder is that it should never be used by pregnant women. There are a couple of other potential side effects of triphala to be aware of as well that are covered on the next page. All of these triphala benefits not only improve your health and well-being internally, they can also enhance your skin and hair’s appearance. Internal cleansing and particularly liver detoxification will often have a beneficial effect on your eyes as well. Your skin’s complexion usually shows the effectiveness, or otherwise, of your internal organs at elimination and removing toxins, particularly your liver. Many people report much better skin and the clearing up of various skin diseases after using triphala churna regularly. The nourishing properties and antioxidant content of triphala make it especially beneficial as a way to improve your skin health from the inside. It’s high vitamin C content also promotes collagen formation for firmer skin tone. Triphala powder is often recommended for acne problems as well. With its strong antibacterial and astringent properties some resources suggest mixing triphala with water into a paste and using it as a face mask acne treatment. Test a small area of your skin first before applying a triphala mask to your entire face. Sensitive skin could show irritation and this method of treating acne would be likely to sting any visible pimples. As important as your hair may be to you, it’s right down on your body’s list of priorities. As such, it’s one of the first to miss out when nutrients are scarce and is usually one of the places that shows up long-term deficiencies and imbalances. Interestingly, triphala is often reported as effective at promoting hair growth. Amla, one of its three ingredients, in particular is well known for its beneficial effect on your hair. But it’s just as likely that improving your digestive system with triphala churna will give your hair follicles back what they need to grow hair properly. Premature grey hair is also often treated with triphala powder in Ayurveda. While the exact mechanism for how triphala prevents further grey hairs isn’t known, it’s broad array of antioxidants can help protect against many different signs of aging. Your eyes are another area that can be heavily impacted by a tired liver and poor intestinal health. Triphala health benefits can also include improving the condition of your eyes and possibly enhancing your vision. In Ayurveda. it has been prescribed to treat dry eyes, strained vision, eye redness and more serious eye disorders like cataract and glaucoma. Taking triphala churna internally for its antioxidants and other nutrients would be valuable for improving your eyes, but you can also make up a triphala eye wash at home which many, myself included have found surprisingly effective. Triphala is indicated for many ailments in Ayurvedic medicine and is indeed seen as something of a cure-all due to its balancing, cleansing and nourishing properties. Some of the most commonly reported triphala benefits include using it as a treatment for irritable bowel syndrome (IBS), to help lower blood pressure, regulate blood sugar and even as an effective weight-loss treatment. It has antibacterial and antiviral properties to help improve your immunity and is a rich source of a broad range of antioxidants to neutralize free radical damage. One of the most powerful of these antioxidants is gallic acid, a compound that has shown great potential in reducing the risk of certain types of cancers like prostate and colon cancer. Triphala powder has even shown promising results in animal studies on treating arthritis and other inflammatory diseases as well as reducing high LDL cholesterol levels associated with heart disease. With such a broad range of disorders reported to respond to taking triphala, it’s perhaps best to think of it not so much as a treatment for individual diseases, but more as a natural way to bring the body back into balance and clear out blockages and imbalances, no matter what label we may put on them. Fortunately pure triphala powder is now readily available worldwide with cheap international delivery to countries like India. Looking for a good formula with organic ingredients I found this Planetary Herbals preparation and have been very happy with the effects when I take it. Some people prefer capsules and, while I feel that powdered whole fruits are better personally, many report great results with this special formulation taken daily. There are a few different ways and times to take triphala which I’ll be covering ahead, but I think there’s a real need for this ancient Ayurvedic healing formula in today’s modern world. This is particularly true in America, with the huge rise in digestive problems like constipation and associated health issues. Perhaps you know someone worth sharing the benefits of triphala with and can help get the word out. I agree that it is worth consulting an Ayurvedic practitioner for best results. This article is meant to be an introduction to a powerful preparation that many people from Western societies would not have heard of yet. Triphala churna is an extermely safe concotion designed to improve overall health. Saved me from 2 years of disastrous damage by yeast infection. Now healthy bowels,better digestion,better focus and overall improvement. Fights infection on all accords. Thankyou for the great vote for the health benefits of triphala. I’m particularly interested that you found it so effective for candida and glad it worked so well for you. I bought these three fruit powder separately. Cn i mix it together (all in same measurement) or it is better to buy premix triphala powder? Taking this triphala powder cn increase sugar level? (Im not a diabatic patient). I personally buy this premixed triphala powder https://superfoodprofiles.com/go/organic-triphala-powder as there is some debate as to the correct ratio. Some resources suggest equal parts whereas others recommend a ratio of 1:2:4 of Haritaki, Bibhitaki and Amalaki. I have gained lot of weight. Appetite has fallen and I lack energy. How shall I take triphala and how much? Should I drink everyday ? Hi Shelley and thanks for your positive comments. I’m glad the triphala is working so well for you and if you’ve found a good dosage for your body then stick with it. I have diagnosed Ulcerative Collitis in 2003 and started taking prescribed medicine Mesacol, and pridnicolane , folic acid but not able to be comfortable for a single day till last year 2015.but from dec 2015 i have started taking trifhala powder with belva powder(bael Fruit) once in a day at bed time in night with warm water and seems tremendous benefit,and improvement in ulcerative collitis for one week i got some problem in bowel movement that is due to its cleanising properties but last six months i have face not a single flare up. Hi Yatin and thank you for your comments. I’m glad to hear that triphala is working so well for ulcerative colitis and hope other people will be inspired to try it for this. I am suffering from blueness of vision and light sensitivity problems. I also have got flatulance problem because of it gas formation is there. After reading your article I have brought triphala powder and eye wash cup. Please suggest me the dosage of triphala powder for internal consumption. Please suggest me whether triphala powder works for my both problems? Early reply from your side will be of great help. I am 22 years old, and my hair is growing grey, I am not unable to figure out the reason. Kindly help me with all the reasons responsible for this and thr remedial steps that i can take to prevent it. Greetings Jim,I’m interested in the powder.how can I get it in Nigeria. If your grey hair is related to an overworked liver or poor digestive function then triphala may well help for greying hair. Unfortunately there are so many potential causes of grey hair though that even a 10,000 word post wouldn’t cover it. I’d suggest visiting a specialist for an individual diagnosis. Researching this on natural health forums like curezone.org can also help. diarrhea will go by itself. One most important thing i want to mention, do not take triphla more than 3 months , after 3 months give break of 25 days and again you can start. For how much time duration should I intake triphala churan to get ride of grey hairs. Everyone is different in how long they take to respond to natural treatment and hair does grow very slowly so it takes a while. I’d also look into he shou wu as well as triphala for greying hair. My daughter is 21 and has irregular periods for many years. She has skin problem, pimples and flaky sclap too. Will Triphala help to regulate her period cycles and improve her skin conditions? 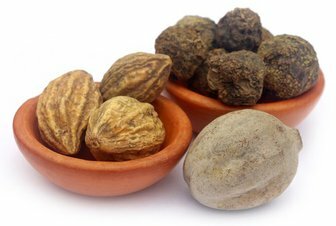 Can Triphala be taken for long terms? Is it good to take 1 spoon of triphla early in the morning when you wake up? Someone says we should eat triphla when all food get digested.it benefits more. As per this article https://superfoodprofiles.com/how-to-take-triphala-churna The best time to take this triphala churna tea is in the evening, a couple of hours after dinner and just before bed. Followed again first thing in the morning with the second dose made from the same triphala powder. There’s much more detail in the article.